The Winery Tour is about three things that are great about New Zealand: our music, our wine and our scenery. from its beginning in February 2007, The Winery Tour has celebrated this country and its people, it is 100% New Zealand. The Winery Tour was conceived in summer 2006 when promoters Brent Eccles and Campbell Smith were looking for a venue in Nelson for a Bic Runga national tour stop. On the advice of locals they booked Neudorf Vineyards in Upper Moutere for an outdoor show. It was a huge success. A magical performance by one of New Zealand’s greatest songwriters in a stunning location. The following summer the promoters announced the first national Winery Tour. They found wineries and vineyards that had the right “feel”, beautiful locations that they thought would complement live music and, of course, produced great wines, and winery owners who understood and were excited by the idea. Due to unforeseen circumstances The Winery Tour regrets to announce the cancellation of the 2018 Winery Tour. As it is not possible to reschedule the tour, full ticket refunds will be available for all shows from the point of purchase and will be processed immediately. If you booked online, over the phone or at a Ticketmaster outlet with a credit card, no action is required from you. A full refund will be issued back to the credit card you used to purchase the tickets. It can take some time to process, so please give Ticketmaster up to 7 days to process your refund. If your original card has expired or is no longer valid (prepaid Visa and MasterCard included), you’ll need to get in touch with the Ticketmaster friendly Customer Service Team on 0800 111 999 between 9am – 9pm NZST Monday to Friday, or 9am – 5pm NZST Saturday to Sunday. If you stopped into one of the Ticketmaster outlets to buy your tickets using cash or EFTPOS, you’ll need to swing by one more time with the tickets, and the EFTPOS card used if applicable, to make the booking. The outlet staff will help you with your refund. If you purchased from a venue or i-site directly, please return to the place of purchase to obtain a refund. Past Winery Tours – this is the eight annual trek – have often ended at the Villa Maria Estate. This time the Mangere vineyard was second of the 11 dates, taking advantage of Auckland Anniversary Weekend rather than its usual mid-to-late February slot. Given Sunday’s cloudless sky that was a good call. Though there was still plenty of space among the nearly 4000 spread across the lawns. But this show made for a fine celebration of a couple of Auckland musical institutions. At the top of the bill, Dave Dobbyn and Don McGlashan combined for a tag-team greatest hits run through their respective songbooks. This wasn’t the hushed reverent ballad-heavy approach of their 2013 church tour together but a happy full-band bash with all the bells and whistles – and sometimes a borrowed Supergroove horn section. And in the case of Slice of Heaven near the end, all of Supergroove subbing for Herbs’ original backing part. The opening Dominion Roadblew the candles out on Auckland birthday’s cake nicely before Dobbyn’s Languagechugged forth … and so it went, like an extended Kiwi music game of last card. Have to say, sometimes McGlashan’s vocals needed some more breathing space in the mix and fulsome arrangements. The nuances in the likes of White Valiant got lost in the party-heartiness of the delivery. But Dobbyn’s keening voice just cut on through everything he sang, from ye olde pub rockers like Be Mine Tonight through to a bouncy Love You Like I Should buoyed by the Supergroove players who also helped blow the fallen leaves out of Nature straight after. If the second half of the set was one here’s-the-one-you’ve-been-waiting-for encore number after another, the actual encores themselves were still special with McGlashan’s Anchor Me paired with Dobbyn’s Welcome Homedelivering a nicely poignant arms-aloft finish. Four hours earlier, it was Winery Tour veteran Anika Moa who got the evening off a highly entertaining start with her solo-ish set which mixed old and new numbers – as well as a cover of Fleetwood Mac’s Dreams – with her between-song comedy sideline. As funny as she was – her intro to My Old Man suggested itself as the start of a sequel to Boy – some of her new songs, like Lover sure sound heartbroken. But with help from producer Jol Mulholland who joined on her stage for much of her set, they aren’t just acoustic guitar mopes but songs that sound a bit, well … “If you think I’m trying to be like Lorde, well I am,” she deadpanned. And on first listen it sounds like it’s working out rather well. She was hilarious and heartfelt too. Then came Supergroove, who turned the stage with its giant inflatable roof into a funk-rock bouncy castle full of excitable blokes channeling the wild adolescents they once were. Which might sound worrying but it was glorious. Especially with a set peppered with some surprises among the expected hits – some of Che Fu’s solo cuts, an unleashing of the band’s best unreleased song Dig In, and Che’s saxophonist son Loxmyn joining the band on stage for a few numbers. Supergroove: The Next Generation? Well the old one clearly hasn’t lost its live mojo or its sense of humour. Next anniversary weekend, how about we put them on a barge, push them out into the harbour, and let them be the fireworks? Sun, sauvignon and song – what could be sweeter? Fresh from the beach, sand still between our toes, we arrived at Waipara Hills, formerly the Mud House, and I heard the sounds of Breaks Co-Op through a grapevine. Andy Lovegrove’s vocals were sublime, even when he was being harassed by a bee. Joined for these shows by Paul McLaney, and Christchurch musicians Richie Pickard and Mark Vanilau, Breaks Co-Op’s latest tracks from their first album in 8 years, Sounds Familiar, came to life, adding new dimensions and depth. Well received by the crowd, a roar of approval accompanied the opening bars of their massive hit The Otherside. Stan Walker and his crew of back-up dancers also had the crowd on their feet and dancing, offering up well known hits like Black Box and Bulletproof, newer songs from Inventing Myself, alongside a cover of Don’t Dream It’s Over in te reo. He also spoke from the heart about bullying and poignantly dedicated his song Bully to “a friend in her 40s who had taken her own life”, presumably in reference to the tragic death of Charlotte Dawson. Marking the third anniversary of the 2011 earthquake, Jordan Luck, frontman of The Exponents, extolled Cantabrians to raise a glass to themselves before leading a minute’s silence in honour of “those souls who were lost”. Then it was a fun nostalgic stroll through the back catalogue of one of New Zealand’s greatest songwriters. Often taken for granted, The Exponents songs are full of our stories and landscapes and hearing songs like Christchurch (In Cashel St I Wait), Lulu, Like She Said, Sink Like A Stone and more in a beautiful outdoor venue, as opposed to a pub, emphasized this. Luck dedicated songs to folks who had come from Reefton, mates from Geraldine and also did an impressive cover of The Angels’ No Secrets in reference to a member of the Australian group who is unwell. As we bundled sleepy children, tired from dancing, into the car, The Exponents were playing Victoria, a song that has long been a personal touchstone. The night was warm and still and just for a moment it seemed like the stars shone brighter. While the trio of acts may have seemed an unlikely match on paper, under the warmth of the Canterbury sun, the plains stretching out in every direction around us, they complimented each other well and offered thousands of Cantabrians a fantastic, diverse evening’s entertainment. Conditions for this four-pronged show were perfect – warm, no wind and not a cloud in the sky. It made a usually festive, picnic atmosphere for the annual Winery Tour an even more relaxed event, and this seemed to touch the performers. Half the entertainment from The Adults – the first of two Kiwi “supergroups” in the lineup – came from self-deprecating jokes from Shihad’s Jon Toogood and Julia Deans, although Shayne Carter was unusually reticent, preferring to underpin each song with atmospheric guitar play. A strong set included One Million Ways, Up and Gone, as well as the ballad Anniversary Day, and Deans comfortably filling in on Ladi6’s album vocal duties on the funky Nothing to Lose. The Adults’ debut was one of the best Kiwi albums of 2011. This confirmed them as one of our best bands. Anika Moa (wearing a blue polka-dot dress), Boh Runga (bright red dress) and Hollie Smith (bright yellow dress) had me at first thinking they’d tapped their inner Wiggle. 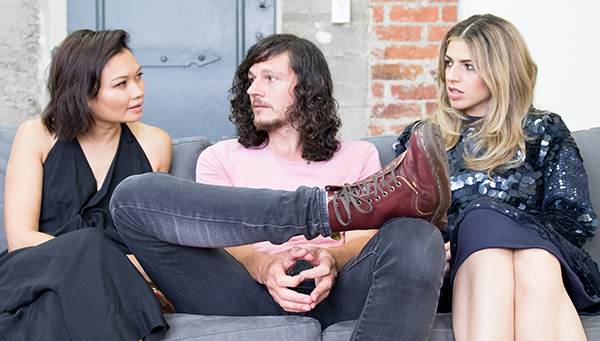 But, like The Adults, Anika, Boh & Hollie have managed to be more than the sum of their parts with new songs as a trio, including Don’t Really Care and the psychedelic-tinged Peace of Mind. On occasion they were also wickedly funny. Fat Freddy’s Drop also confirmed what I’ve felt about other Kiwi acts, including Shihad and The Datsuns: While proficient on albums, it’s playing live at which these bands really excel. Silver and Gold was stunning. The band has seamlessly incorporated horns into its sound. Regrettably, I missed opener New Zealand’s Got Talent winner Clara van Wel, although I could hear her as I scrambled down the long entrance to the vineyard. Friends who had arrived earlier – and had no idea who she was – were nonetheless very impressed. 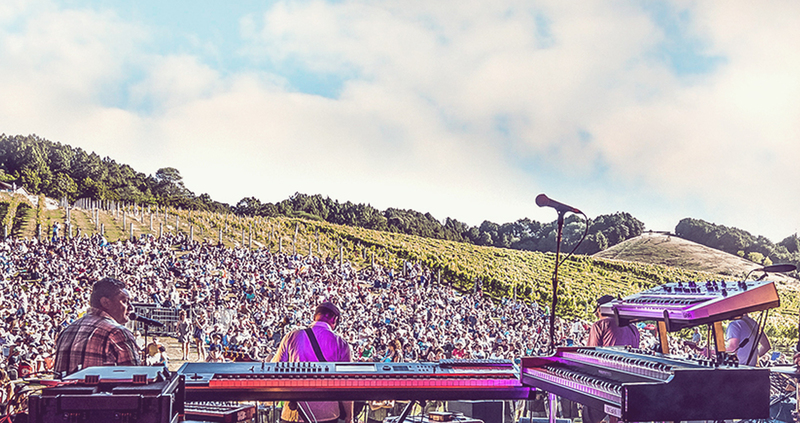 With the largest crowd yet in attendance, over 5000 people, for this leg of the 17-date Classic Hits Winery tour, aperitif act Avalanche City’s oft-played tune Love Love Love proved an accurate description of the crowd’s collective mood. The lineup of Gin Wigmore, the reformed Mutton Birds and Avalanche City was a surprisingly savvy one. While it seemed an incongruous mix on paper, all three acts connected and engaged the all-ages crowd. Up in the crush of bodies near the front of the stage, I felt a tug at the back of my skirt and apprehensively swung around, ready to give someone the beady eye. I looked down to see a little girl aged around 4 trying to push her way closer to the stage. Later I saw her on her dad’s shoulders, fists pumping the sky along to the richly textured instrumental depths of Mutton Bird’s Queen’s English. Frontman Don McGlashan, bassist and co-vocalist Alan Gregg, guitarist David Long and drummer Ross Burge reunited just for this tour after a decade apart. Their performance was less about nostalgia and more a celebration of the spectacular alchemy which happens when these musicians get together. It was delightful to fall headlong into their detailed, clever storytelling once again. The Mutton Birds dedicated a song written about “this part of the world”, Too Close to the Sun to Christchurch. It was breathtaking for its subtle depth and exquisite harmonies. In particular, the inimitable Burge seemed to be really enjoying himself, I could have listened to him for hours. On A Thing Well Made, they might have been talking about themselves, and experiencing the transformative power of music such as this, refreshed in new clothes in a picturesque outdoor setting under a big sky, was magical. The clever timing of McGlashan on euphonium during The Heater, made it feel as if time stood still momentarily. After coaching the willing crowd into two-part harmonies for The Fourmyula cover, Nature, McGlashan stood with a cheeky smile and admonished the crowd down the back for not singing loudly enough. Then he smashed his guitar to smithereens on stage. Today instrument destruction is seen as a somewhat self-indulgent act, but to witness someone as gentlemanly as McGlashan annihilate an instrument was strangely cathartic, if somewhat unexpected. He grinned all the while, woodchips flying. Everyone sang Nature together loudly after that. At the end of their set, the Mutton Birds signed the biggest chunk left of the guitar, and McGlashan gifted it to a 48-year-old fan celebrating his birthday. Headliner Gin Wigmore was greeted by unfettered adulation from the crowd. Wine with a sharp, sweet-and-sour tang can be described as having acescence, and the description is also an apt one for Wigmore. Her song descriptions – “this one’s a nasty motherf…er” – caused parents to hastily cover their children’s ears, but her high energy set had the crowd enthralled right from the start. Dedicating her sweet ukulele ballad I Do, with its touch of Somewhere Over the Rainbow to Christchurch was well received. Wigmore described the venue and crowd “as the best on the tour”. She was in excellent form herself. The night peaked with the darker numbers off last year’s Gravel & Wine album, particularly the hip-shaking Man Like That and One Last Look, the seductive Dirty Love and the growling psychobilly of Kill of the Night which showcased the range of her unique voice. Crowd favourites included her hits Black Sheepand Under My Skin. It seems Gin and wine go together after all. About 2000 people turned out to the Ascension vineyard last night despite the drizzling rain and congested peak hour traffic to watch Midnight Youth, Op Shop and Brooke Fraser perform. Families, fold out chairs, blankets, wine, and a little bit of down home with a sign on the fridge in the wine tent reading, “No staff in this fridge, there is temporarily 1/4 of a bull in here,” made for a warm and welcoming family atmosphere. Unfortunately traffic meant we missed Midnight Youth but arrived at the beginning of OpShop’s set with Jason Kerrison already holding the doting crowd in the palm of his hand with his Kiwi charm, offering to see them all afterwards for a beer. Despite some more unusual addresses like asking the “humans” in the audience to wave their hands in the air, people really do seem to think Kerrison is the man. Energetic on stage with his signature voice resonating through the vines, he bounced around the stage delivering a mixture of songs from both his new album Until the End of Time and old faves like One Day, leaving the audience happy and hyped ready for the beautiful Brooke Fraser to take the stage. And an impressive stage it was, as was the sound which was excellent for an outdoor gig. Fraser arrived to an welcoming audience who she spoke to throughout the set – acknowleding the people on the grass bank, who she thought might been having a bit of “hanky panky” warning them to make sure it was safe. Better than her slightly awkward crowd addresses was her singing. Fresh from sold out tours in the US, Canada and London her voice was as clear as ever, delivering a beautiful cover of a Nina Simone song and easily getting the crowd on board to sing old favourites like Better. Getting a beer or a wine was easy, and my Ascension Sav was delicious and well priced. Food stalls selling among other things – popcorn and Belgium sausages were well recieved, but many chose to bring picnics. My advice – bring a fold out chair unless you are getting there early to avoid being stuck craning your neck. With older people on their chairs nodding their heads to the tunes, babies charming strangers for crackers and couples snogging in the trees, the More FM winery tour got New Zealanders out to support local musicians. Win. 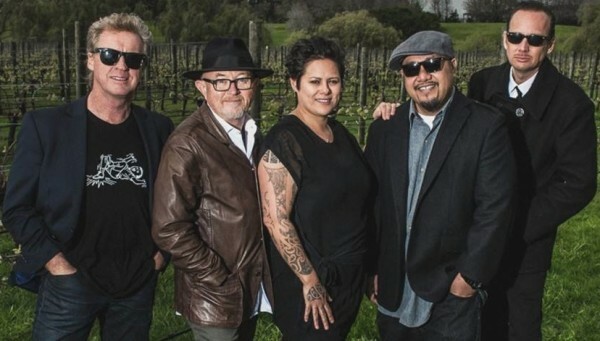 Tutukaka had its biggest concert in more than a decade last night when national music icons Tim Finn, Bic Runga and Dave Dobbyn played the third date on their nationwide winery tour. The show featured performances by Finn, Dobbyn, Runga, singing many of their – and New Zealand’s – greatest songs. Boh Runga and Che Fu also performed an amazing set at the show. The tour kicked off with sold out performances at Matakana’s Ascension Wine Estate, 10km northeast of Warkworth, and an hour south of Whangarei, for the first two dates of the 18-show tour on Friday and Saturday. It’s also almost a decade since Finn, Bic Runga and Dobbyn first shared the stage performing their own and each others’ hits. The trio provided a two-hour, back-to-back selection of all of the singers’ famous hits – songs that have cemented them as New Zealand music stars. Boh Runga performed songs from the Stellar* songbook as well as her solo material and was joined on stage by Supergroove frontman and solo star Che Fu, who brought his own hits such as Fade Away and Misty Frequencies to the set. The tour is the first time the two powerful vocalists will have performed together.